Thoroughly mix the beef and 1/4 cup barbecue sauce in a large bowl. Season the beef mixture as desired. Shape the beef mixture firmly into 4 (1/2-inch) burgers. Lightly oil the grill rack and heat the grill to medium. Grill the burgers for 15 minutes or until cooked through, turning the burgers over halfway through the grilling time. 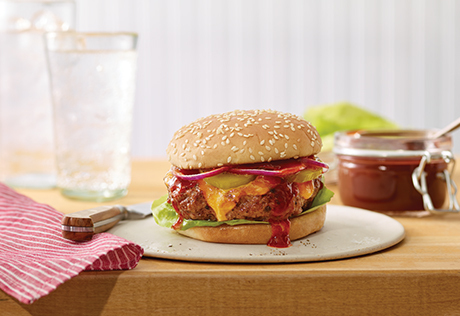 Top each burger with 1 slice cheese and grill until the cheese is melted. Place the lettuce on the buns. Top each with 1 burger, 1 tablespoon remaining barbecue sauce, 3 rings onion and 2 pickle slice halves.